The race for technological supremacy was at its height at the beginning of the Eighties - multicylinder, multivalve engines were all the rage, and the latest novelty was the turbocharger. Costly, and often imperfectly engineered, the turbo proved a flash in the pan, but that didn't prevent the best of the turbo bikes from acting as a superb technological showcase for their makers. 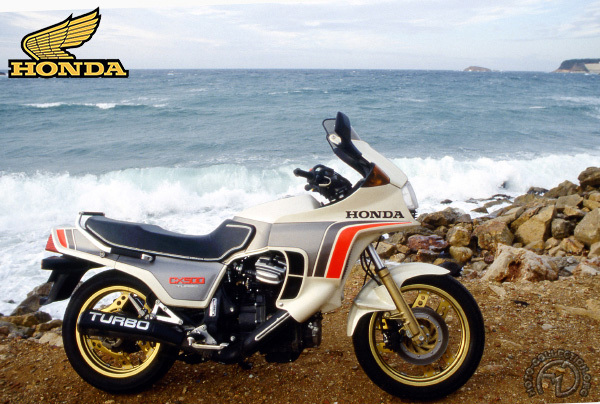 Launched in 1980, the Honda CX 500 was the most daring attempt at producing a high-tech turbo bike. The world's leading manufacturer at the time, Honda had chosen to turbocharge a relatively small engine, and complicated the problem further by choosing a V-twin. Honda achieved its aim in a masterly manner, though at the expense of fearful technical complexity. If the original CX 500 was plagued by a turbo that came in too sharply, the CX 650 that followed was one of the best sports/touring bikes ever built. But it came too late. The turbo craze was over soon, and performance-hungry motorcyclists began turning towards increasingly large naturally aspirated engines. Honda had done its best to make the CX Turbo a success by employing the renowned Italian automotive stylist Giovanni Michelotti, who created a shape that was as practical as it was innovative. The CX's fairing offered a rare level of protection while forming an integral part of the machine. The CX 500 was a marriage between Japanese know-bow and Italian style that resulted in an excellent touring bike.